OKLAHOMA CITY — The Oklahoma City Blue (9-10) posted a strong third quarter to defeat the Northern Arizona Suns (7-11), 103-87 on Tuesday night. The Blue held the Suns to 12 points in the third quarter, its fewest points allowed in any quarter this season. 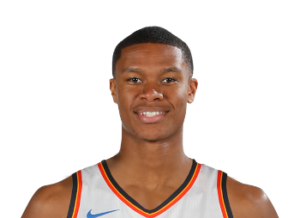 Thunder assignment player Terrance Ferguson and two-way player Daniel Hamilton powered a 9-0 run midway through the third quarter to put Oklahoma City up by 20 points. Ferguson tallied 11 points, six rebounds, two assists, and a steal, while Hamilton contributed a double-double of 12 points and 10 rebounds. The Blue had six players in double figures for the 10th time this season, including a career-high-tying 18 points from PJ Dozier. The teams went back and forth for most of the first half, but the Blue went on a 16-0 run in the second quarter, taking a double-digit lead. While the Suns would claw back into the game, Oklahoma City still held a 48-46 lead at halftime. Anthony Bennett led the Suns with 21 points and eight rebounds, his ninth game in double digits this season. The Blue will take on the Northern Arizona Suns once again on Friday, Dec. 22nd at the Prescott Valley Event Center at 8 p.m.